Ultra light and just about opaque, the glittering good looks of our ankle high SockShop Fashion Collection Plain Lurex Socks will serve to glam up just about any outfit that you can think of. These ladies nylon and silver Lurex sock/stockings come as a twin pack, with deep, ribbed design cuffs and run to a seamed toe that will work well with open-toed shoes. 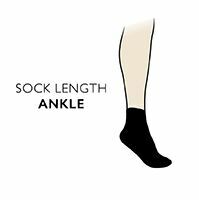 Use these SockShop Fashion Collection Plain Lurex Socks to easily add instant eye appeal to tired trouser suits or dull basics, or wear them as a statement with skirts and shorts.